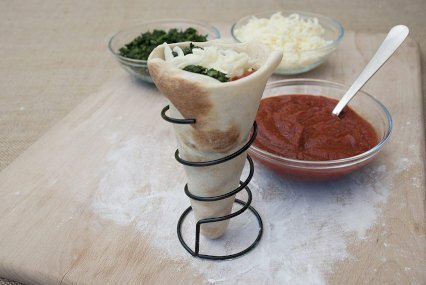 Pizza Cones are a fun way to make personalized pizza with your friends and family. 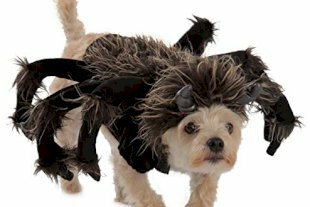 For use in oven or grill. 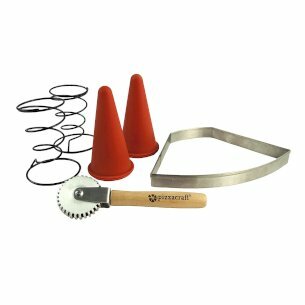 Roll out pizza cone dough to 1/8" thickness and large enough surface area for the dough cutter to fit twice. After cutting the dough into shape, remove excess dough. Moisten the edges of the dough with water or egg wash and fold the dough over in half so the edges meet. Press down on the seam with your fingers and then run the crimper along the edge to thoroughly seal the seam. Let the cones rest on the cutting board for 10-15 minutes; re-roll remaining dough to form additional pizza cones following the process described above. Preheat oven or grill to 400 F. Rub oil onto the pizza cone mould to prevent sticking. After dough has rested, carefully slip the dough onto the pizza cone mould. Bake for 6-7 minutes or until cone begins to brown. Remove from oven; let cool for 2 minutes and remove from mould. Rub oil onto pizza cone stand to prevent sticking. 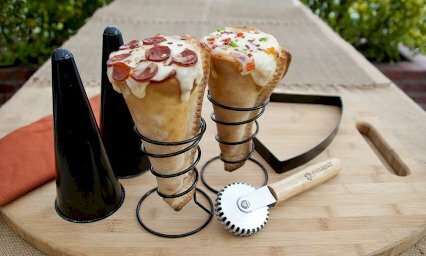 Place cone into the pizza cone stand, fill with your favorite pizza ingredients, return to the oven and bake until golden bubbly. 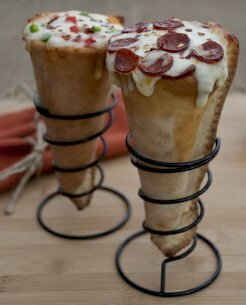 Let baked pizza cones rest for a few minute before consuming.